On 11th February 2017, Calcutta based Hindustan Motors (HM) announced that it sold the brand ‘Ambassador’ to the PSA Groupe (Peugeot S.A), France for a sum of US$ 11 million (Rs. 80 crores). It was the end of the saga that ran successfully for over 60 years that began in 1954 with the introduction of the Hindustan Landmaster (Morris Oxford Series II) and little later the Hindustan Landmaster Traveller (estate version with partial wooden body and rear barn door). If there is any car that is synonymous with motoring in India, it is this ‘Grand Old Lady’. It became the symbol of governance in India with every single government establishment starting with the Prime Minister’s office, the armed forces chiefs and down to the lowest rung in the bureaucracy using the Ambassador as its official car. Also known as the ‘Sarkari’ (government) or the ‘Lal Batti’ (red beacon) car, it is said that 17% of all the Ambassadors produced were brought by the Government of India. Even until this day, these cars are preferred by Ministers who are from the old era. Though its origins are British (Morris Oxford Series III), it didn’t quite set the roads on fire in its home country, but in India it did. In 1958, Hindustan Motors started its production at Uttarpara, a distant suburb in Kolkata (Calcutta) plant, little knowing that it will turn out to be India’s most iconic car. 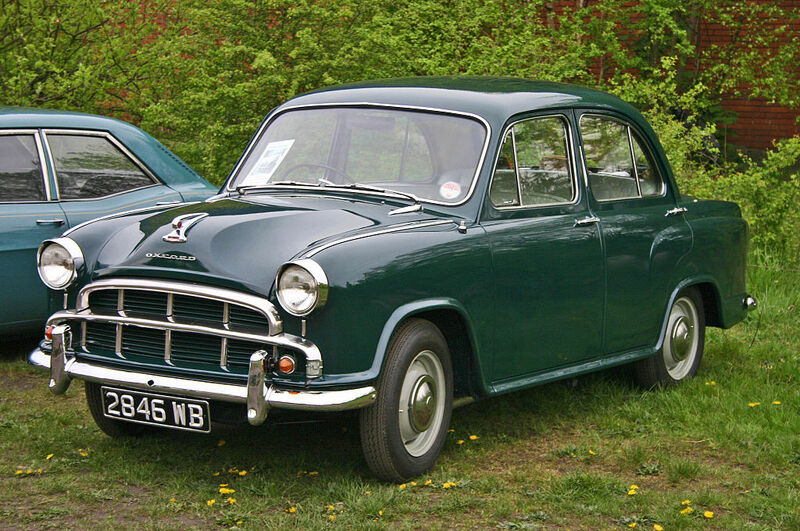 The first model was named Hindustan Ambassador Mark I (produced between 1958-1962). A very basic car yet it seemed perfect for Indian roads with its robust body, 14HP engine and having a five-speed manual transmission. It was easy to maintain and spacious enough for large Indian families. With its cavernous boot and a bench seat in front it could with a reasonable degree of comfort, seat six adults. It was an easy to maintain car with spares readily available and its non-hi-tech engine could be fixed by the average road-side mechanic. No wonder it was said that the Ambassador moved India on four wheels. In short, a perfect family car. The Hindustan Ambassador is probably the car with the longest production run in automotive history. Starting from 1958, covering about half a century, it was in production right up to 2014. Over the years cosmetic changes were made but the body shape remained the same. With each of these changes, the car got graded as Mark II (1962-1975), Mark III (1975-1979), Mark IV (1979-1990) and the Nova (1990-1999). There was a last ditch effort to survive and so other variants such as the Ambassador Classic, Ambassador Grand, Ambassador Avigo and Ambassador Encore were produced during the final years (2000-2014). The launch of the Maruti Suzuki in late 1983 opened the auto sector for foreign players to step-in, spoiling the customers for choice of cars. With new technology and better fuel efficiency in the market, the humble Ambassador was losing it foot in the market. Hindustan Motors still managed to keep its head above the water with government orders but it was only a matter of time. Even today we can find a few Ambassadors on the Indian streets looking as majestic as ever. Many are found as taxis in India and a reasonable number of them are on the streets of Kolkata (earlier Calcutta) even today. My personal connection with the Ambassadors is when my dad bought one in April 1958, a few months after I was born. It was bought from a Dehradun showroom called Das Motors in Meerut (my dad was then an instructor at the Indian Military Academy (IMA), Dehradun). I remember my dad telling me that he paid a princely sum of Rs.13,500/- for it, not knowing that a brand new ‘Amby’ would one day sell at Rs. 5,50,000 (this was the price in 2014). I have literally grown up with it and learned to drive in it. It was a lucky car for us as, never once did it let us down on the road. It is probably the only Indian car, leave alone Ambassador, to have gone to Srinagar (J&K) and down to the South to Kanyakumari twice.